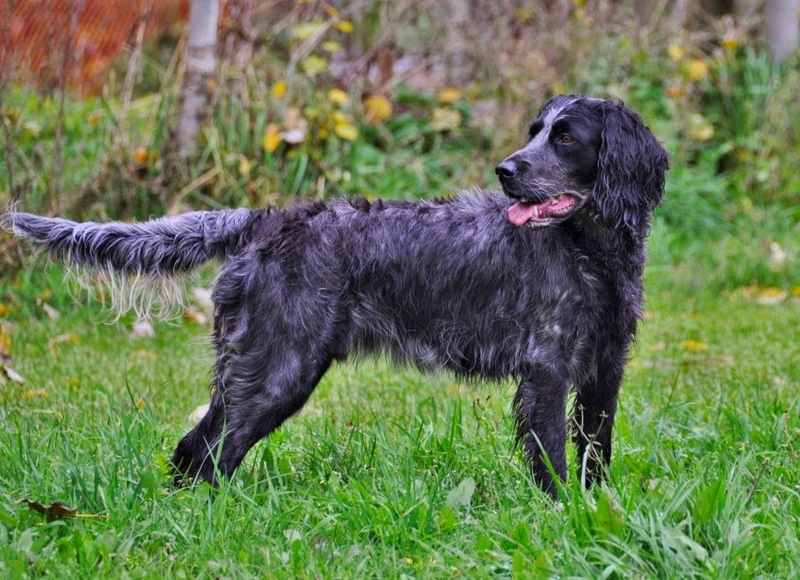 The 2015 Blue Picardy Spaniel Calendar is here!! This 11"x16" calendar is spiral-bound and printed in full color. This year, the cover is "Lola", a resident of California! "Thank you" to all who submitted! Unfortunately, Canada Post and USPS costs increased and so did calendar prices. and $15.00 (for US orders). 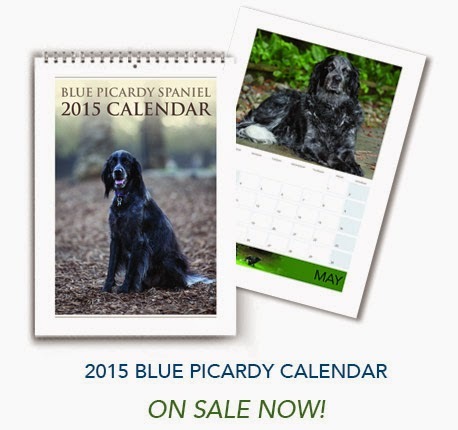 **Please email us (bluepicardy1@gmail.com) if you would like to order over 5 calendars. A discounted rate will be applied. Order now to ensure Christmas delivery! The Brighthope Blues and their humans always enjoy the time spent "hunting" and "strolling" through Picardy Park. Over the years the trees have grown quite alot and at times we have to do some tree trimming along the pathways. We decided this year to use the branches and twigs for some decorating. We called upon our "creative daughter" to show us how to make some outdoor arrangements. It started out with Laurie telling us where to put each branch and in the end we "watched" as she did the arranging. We said goodbye to Dani yesterday. It was sad, but we knew she had lived a good "dog's life" in her 13 plus years. 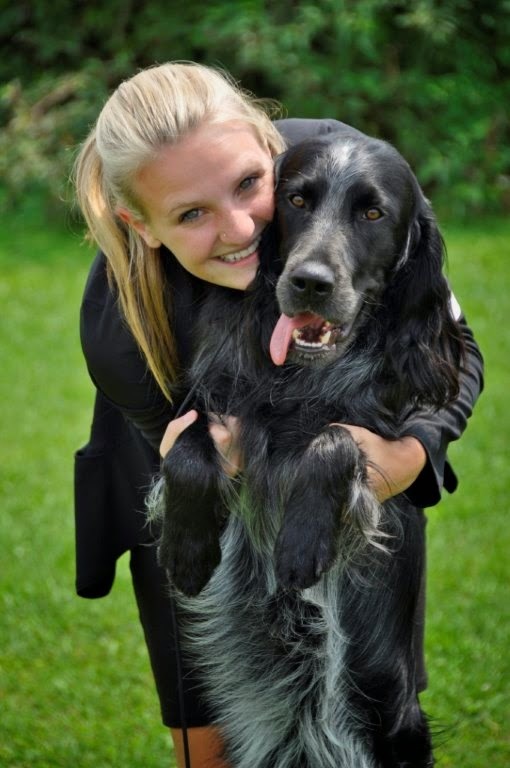 Imported from France in September 2001 Dani spent her first years with the late Kim Spelmer at Shireoak Kennels. 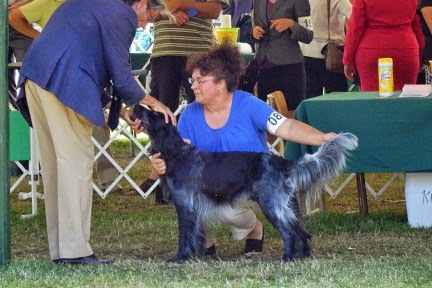 She was a beautiful show dog and became a Canadian Champion. It was then time for motherhood. Dani produced one puppy from her first breeding. That puppy became our first Blue Picardy Spaniel, CH. Shireoak The Midnight Storm, Mr. Ciron, as he is sometimes referred to. Dani moved to Brighthope and produced her last litter here in May 2008. When her motherly duties were finished I had a perfect home in mind for her with my dear friend Maureen. 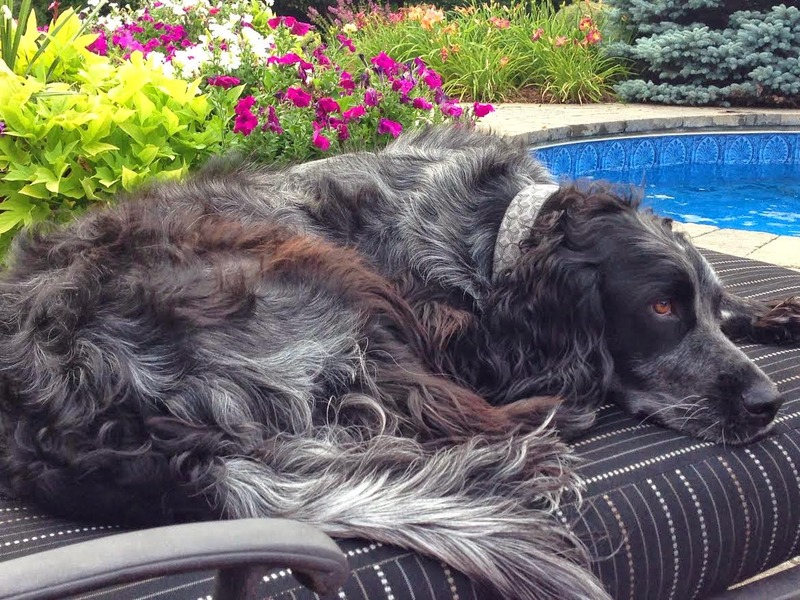 Dani lived the last 6years being loved and pampered as the only dog. She was totally devoted to Maureen and there was a beautiful bond between them. Goodbye sweet Dani, we will miss your lovely old soul. WHY.............that's what the Blues have been asking the last few days. It's time to get up.....WHY are you still in bed?? It's time to eat....WHY aren't you feeding us?? It's time for a walk.....WHY aren't we walking?? It's time to go to bed......WHY are you still up?? Dogs live in the moment, so when you take sixty of those "moments" and move them, the Blues let you know that you shouldn't be messing with their schedule. The "fall behind" time change always makes it interesting here at Brighthope. Here is a lovely picture that our daughter Laurie took on the weekend when she was "dogsitting" for us. Dave and I both love the outdoors and we all know how much the Blue Picardies love the outdoors and their humans............so some fall camping made everyone happy. 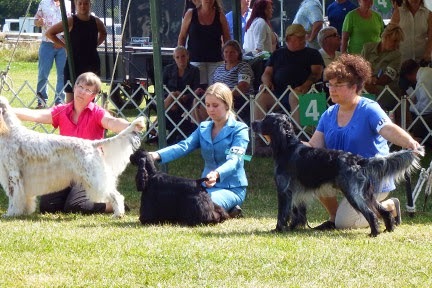 I had asked Kim if she could send me some random photos that her husband Pat may have taken at the Kilbride Dog Show. Of course she sent me some right away. When this picture turned up in my inbox I knew it was time again to make mention of the guy that makes Brighthope tick. Dave is the one that really does keep things going here at Brighthope. I can just imagine that he is giving some good advice to our granddaughter Katelyn in this picture. He is always ready to listen and let me "bounce" things off of him. The final decisions about our dogs is always left to me, but I certainly seek and value his opinion. He can always see things from different angles which helps "this breeder" as my heart sometimes doesn't listen to my head. I am very thankful for my "voice of reason"
Once again this computer decides for itself what it will do and I just go along for the ride. I have been trying to post this announcement for over a week and finally it will let me. CH BRIGHTHOPE POWER POINT aka DAX owned by Kim and Pat is the latest Brighthope champion. Owner handled by Kim from start to finish. Way to go to both of you. 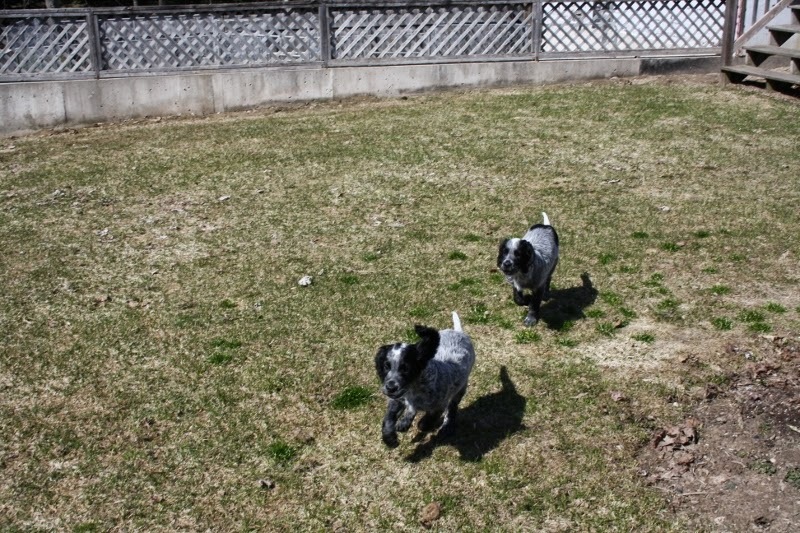 The Ratigan's are now the proud owners of two Canadian Champions, because we can't forget Suede, Ch. Brighthope Blue Suede Shoes. This breeder is always very proud of our "BRIGHTHOPE BLUES"
I love getting pictures of "our puppies". Yes, even after our baby Blues leave Brighthope they will always remain "our puppies". I take great enjoyment in knowing that "our puppies" have such wonderful lives with their owners. Dax is a Ciron and Allure puppy born November 2010. Blue is a Reign and Allure puppy born in January 2012. 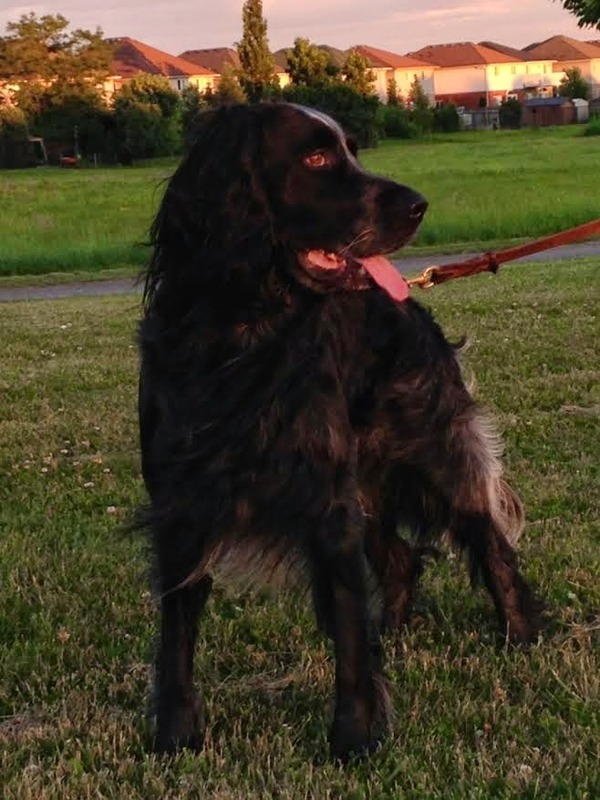 These Blue Picardy Spaniels really do live "a dog's life"
Brighthope loaded up the Blues and headed to Thorndale for the Sporting Dog Specialty this past weekend. Grampa Ciron showed Lyle (his son) and Stanley (his grandson) how it is done. It was great to be in the ring again with Ciron. At 10 plus years old he still moved like a dream and put a smile on my face. Lyle moves just like his daddy. At 17 months old he still has some maturing to do. And Stanley......... well..........he is all legs right now at 5months old. So once his body "catches up" he should figure out just where to put them when running around the ring. All in all it was a fun weekend. 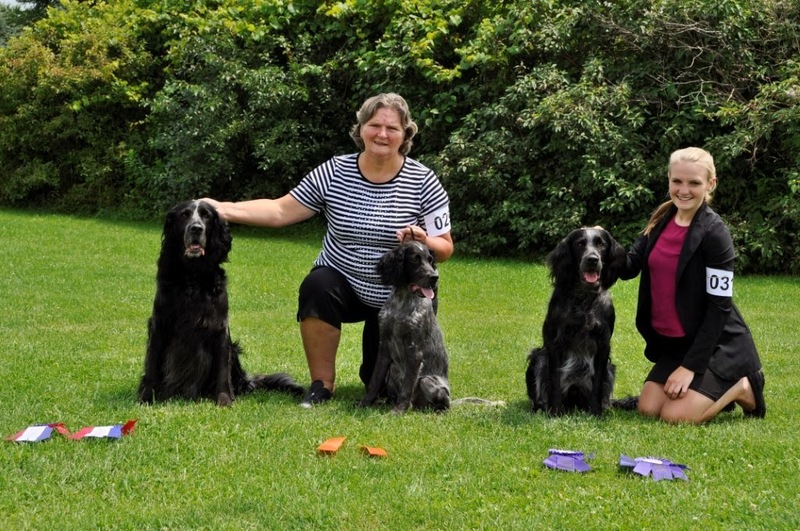 A few years ago the Canadian Kennel Club added a new class to their conformation shows. It is for puppies 3 months to 6 months old. What would you call this class...Baby Puppy Class of course. It is a good way for the babies to get some ring experience and they get to hang out with the big guys. And that is exactly what Stanley did this past Sunday. While he waited for his turn in the ring, he took a real shine to a little miniature Dachshund and they played and played. Sorry, but Stanley's human forgot to take the camera so you will have to take my word for it that they had lots of fun. By the end of the day little Stanley was one tired puppy. The ride home was over 2 hours and we never heard "a word" from him. This picture was taken today after Stanley had a few days rest. We are still under water here at Brighthope, so I made the right decision to cancel the picnic. So instead of sitting around feeling sorry for myself we headed out for a few days of camping. The Brighthope Blues certainly must like camping because they are always so well behaved. STANLEY, WHAT ARE YOU DOING??? Taking pictures of dogs is a lot like children........there is always one in the group not cooperating, in this case it was Stanley. Oh well, puppies are puppies are puppies!!! Stanley and Gibbs spend a beautiful day in the sunshine. Gibbs will be leaving for his new home tomorrow and all the other puppies are with their new families so Stanley will be missing his brother. He will have to start hanging out with the adults....boring. WHICH WAY SHOULD WE GO?? Grandchildren and puppies make for a great day. Puppies had lots of company this past weekend. Love the temperament of all these puppies. It is always good to have the puppies meet new people and Kim is always a willing friend to make the drive up to Brighthope for kisses and cuddles. Puppies moved to their new home a few days ago. Of course these are the four boys. Little miss has had enough of her rowdy brothers. We had postponed kennel visits for the last few months because of the weather. We are having an Open House this Saturday March 22. Please contact us if you have been wanting to meet our Blues and would like to visit on Saturday. We will be available from 11am -4pm. The Brighthope Blues are always eager to get started in the morning and let the "leader of the pack" know when it is time to get going. I am a morning person so that is fine with me. Eclat has started a new routine earlier then normal, she starts "talking" (yes, Blues do talk) loud enough for me to hear upstairs. Once she goes outside to do her business, she comes in for breakfast and then heads back up to her puppies. Then they have their breakfast and they all go back to sleep for another hour. It is very peaceful to watch Eclat and her babies. I have spent more then a few mornings, coffee cup in hand, just observing this little family. Time for the puppies to leave their secure little spot and try new things. Different areas of the house, different floors etc. all help to develop their skills. "YOU GO FIRST" " I'M NOT GOING FIRST, YOU GO FIRST"
Looks like these two were "duking it out" and feel asleep during round three. PUPPIES ARE JUST TOO CUTE!!! Seems like this little fellow had a bit too much lunch. I couldn't even wake him up for a weigh in. Sooo..... "let sleeping dogs lie" or in this case "let sleeping puppies sleep"
Puppies are now one week old. All have more then doubled their weight and already I am seeing some good standing attempts. Eclat is so calm and gentle with her babies and I love to watch the interaction between them. Oh, who am I kidding...... I just love to watch puppies. Lovely markings on this litter. I took 10 pictures to get one good one. Thanks to digital. This photo was taken through the window so is a bit blurry......but turkeys are big so not hard to spot. The rest of the winter could get costly feeding these critters. Not to worry they will not end up in the roasting pan. So, February 15th is National Flag Day in Canada. We would like to introduce our very own flag bearers. Thank you Éclat and Dapper for a job well down. Looks like we already have a theme for this litter. We were expecting 2 (maybe 3) so we are thrilled with this group. Four boys and one girl. Received some nice snow photos of June in North Carolina. Apparently there has not been any snow for June to play in until yesterday. 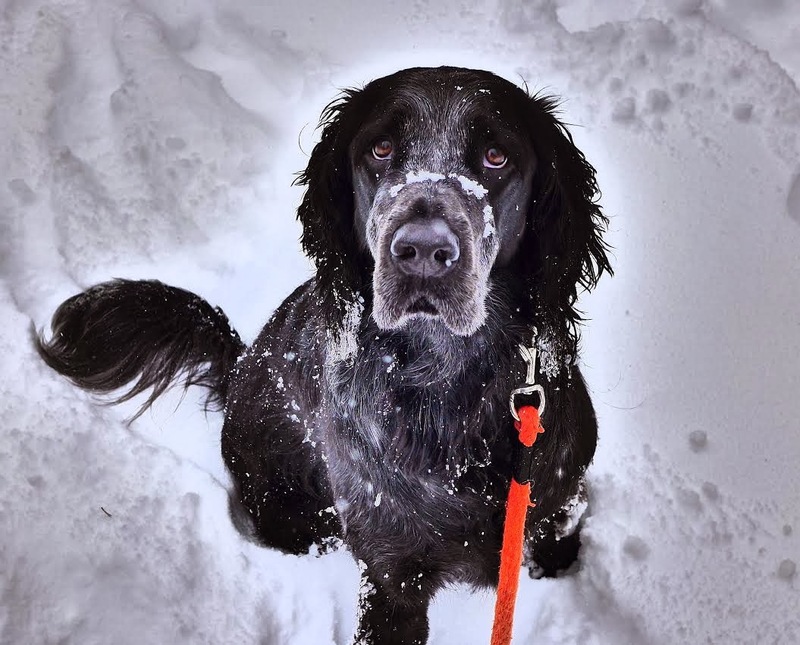 June lived in Michigan for awhile and like all "True Blues" she knows that snow is fun, fun, fun. We certainly didn't mean to hog all the snow this year. So to all our Brighthope Blues to the south of us, we will be more then happy to share the snow from now on. Just ask, please, please take some of our snow!! !